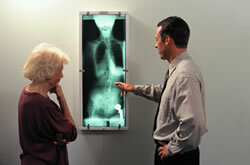 Why Does a Chiropractic Doctor X-Ray the Spine After a Motor Vehicle Accident? A chiropractic clinician can by radiographic study, in addition to palpation (touching for tension or abnormal tone of skin, ligament or muscle) and four quadrant range of motion analysis of a joint or spinal area differentiate between pathologic and non-pathologic muscle versus ligament conditions. A further radiographic analysis will establish of differentiate if disruption or none alignment of interosseous relationships. This medical decision must be ruled upon shortly after a motor vehicle accident and subsequent associated spinal injuries occur. In normal spinal structural details that are revealed on an x-ray, the posterior corners of articulating (joint) surfaces of the superior vertebral body line up neatly with the subjacent (one vertebra below) segment. In addition, the surface of two contiguous facets from the vertebra above and the one below must have a congruous plane of inclination. When a normal cervical spine is in motion, the parallel and congruous interrelationships of adjacent vertebral body segments result in a smooth sliding of each superior vertebral body relative to the vertebral body immediately below. Thus a symmetrical pattern of motion is seen in motion of the cervical spine or lumbar spine. A typical feature of the mechanism of movement of the lower cervical vertebrae is a sliding motion of the superior vertebrae relative to the inferior partner. In consequence of this sliding motion, a step is formed along the ventral wall of the spinal canal in flexion and a reversed step in extension. In flexion the dorsal borders of the vertebral bodies are thus arranged like a flight of steps, while in extension the arrangement resembles a washboard pattern. Penning L. Non-pathologic and pathologic relationships between the lower cervical vertebrae. The American Journal of Roentgenology, Radium Therapy and Nuclear Medicine. 1964; 91:1036-1050. In the pathological cervical spine, one that has been injured due to disruption of the ligamentous structures of the cervical spine will not show parallelism and congruity that normally characterizes the relationship between surfaces of contiguous vertebrae. By skilled training and many years of applied practice your chiropractic will ‘read' an X-ray of the spine to determine or rule out the presence any gross pathology or any disruption of normal osseous tissue structure. He or She will accurately determine the manner in which a misaligned vertebra impinges upon the immediately subjacent vertebral body, both of which exhibit abnormal and pathologic motion patterns. If the otherwise smooth normal curve of the cervical spine is pathologically disrupted, under the gentle and safe care of a chiropractic doctor of medicine, optional health is restored to the nervous system housed by the spine.